Do you need expert Ramsey asphalt and pavement sealcoating services? Call (201) 327-5258 today for high quality service you can count on. See our exciting money-saving coupons and deals when you click here now. When you “sealcoat” an asphalt surface, you are effectively sealing in all of the good qualities of the asphalt to help the pavement last longer and prolong its useful life. Anytime you lay down an asphalt driveway, walkway, playground or parking lot, the goal is for it to last as long as possible. Sealcoating is one way to ensure that happens. Want to know what other people in your area think of our services? Click here to find out! Pavement protection is the main benefit of asphalt sealcoating. It will protect against the elements, such as sun, wind, rain and snow. If the pavement is left exposed, it can harden and become brittle, which causes it to crack and break apart. Sealcoating helps to counteract this kind of scenario because it provides a waterproof membrane, keeping water out of the base material. Sealcoating also helps to increase the surface friction, preventing a condition known as raveling that is caused over time as traffic wears down the fine material from the pavement. Adding a sealcoat won’t allow this to happen as quickly, effectively extending the life of the pavement. Sealcoating is not a structural fix for your asphalt surface, but it does work quite well for general maintenance purposes. Sealcoating is usually recommended for surfaces that have low to moderate raveling, block cracking or transverse or longitudinal cracking. If the surface is smooth and has low friction, sealcoating is also a recommended treatment. When Should Sealcoat be Applied? 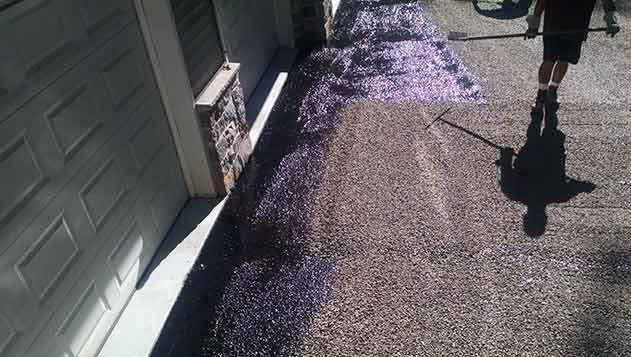 Ideally, a sealcoat should be applied on a warm, sunny day with lower humidity levels. If the weather is cool or humid, the curing time will be longer and it will be softer for a longer period of time, making it susceptible to damage. If there is rain in the forecast, it’s wise to hold off on the sealcoating treatment until you can be sure the showers will stay away and it’s going to be a warm, sunny day. Finding a reputable contractor to perform your sealcoating service will ensure the coating is applied on the right kind of day and will react as it is supposed to react. Don’t let that great looking paving job go to waste by leaving it at the mercy of the elements. Call McFarlane Asphalt at (201) 327-5258 in Ramsey, NJ and the surrounding area for professional sealcoating services that will protect it for years to come.